Dr. Guan Yi is a virologist and an avian flu expert who is currently working as a microbiology associate professor at the University of Hong Kong (HKU). To the right you see a picture of Dr. Guan Yi (provided by Faculty of Medicine, The University of Hong Kong, 2004). In May 2003, Dr. Guan Yi and the Shenzhen Centers for Disease Control (CDC), made a discovery that the masked palm civet, raccoon dog and hog badger carry a virus which is very similar to the coronavirus that causes SARS. 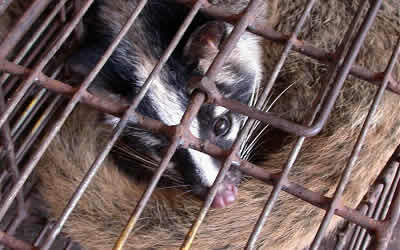 This resulted in the Guangdong government temporarily banning civet cats' sale and the closing down the wildlife markets. "I felt like I had to do something." However, another research carried out by a mainland Chinese team challenged his findings, claiming no evidence of the existence of the SARS coronavirus in civet cats. Hence, the Chinese government decided to lift the ban on sale of civets in August. Nevertheless, Dr. Guan Yi firmly believed there is relation between the animals in the wildlife markets (in cities of China) and the SARS coronavirus, and was determined to prove his case. Since October 2003, he has been making weekly trips to the wildlife markets of Shenzhen and Guangzhou to collect samples. When he brought the samples back to Hong Kong, he found the SARS coronavirus in host of rodent species and also in hog badgers, Eurasian badgers, raccoon badgers and ferret badgers. Even more astonishing were the results from the genomic sequencing, as it showed that these coronaviruses had mutated to become more similar to the SARS coronavirus samples taken from humans during the first SARS outbreak. All this was confirmation that the SARS virus could strike again. The possibility of another outbreak emerged when a suspected SARS case was reported in Guangdong in December 2003. "I mean, why do you do science? To write papers? Or to make a difference in the real world?" Dr. Guan Yi immediately framed a simple letter to Beijing's Hong Kong and Macau Affairs Office, which he copied to the Ministry of Health and the China CDC. Subsequently, the Guangdong government invited him to Guangzhou on January 3 2004 to prove his findings. A detailed comparison and analysis of the genetic sequences for the new SARS case in Guangdong and the samples of wild animals presented by Dr. Guan Yi revealed that the two viruses were almost alike. This convinced Dr. Zhong Nanshan, director of the Guangzhou Institute of Respiratory Disease, who called Governor Huang Huahua to persuade him of the possibility of another outbreak. An order was then issued to the Guangdong Health Department and the Guangdong Forestry Department to launch a campaign to eradicate civet cats from the province's farms and markets. Regarding the issue of whether the culling of civets cats were really necessary to break the chain of transmission of SARS and how significant Dr. Guan Yi's findings have been, only time will tell. Article from TIME Magazine about civet cats, the SARS virus and Dr. Guan Yi. TIME.com: Averting an Outbreak. TIME Online Edition (11 January 2004). [Online].